A young girl, Liv, lives with her mother on a remote island in the Arctic Circle. Her only friend is an old man who beguiles her with tales of trolls, mermaids, and the huldra, a wild spirit who appears as an irresistably beautiful girl, to tempt young men to danger and death. Then two boys drown within weeks of each other under mysterious circumstances, in the still, moonlit waters off the shores of Liv's home. Were the deaths accidental or were the boys lured to their doom by a malevolent spirit? "The novel invites you to view storytelling as akin to madness...In a book that often makes coded reference to itself to provoke serious thought as to what fiction is about, this counts as a joke. 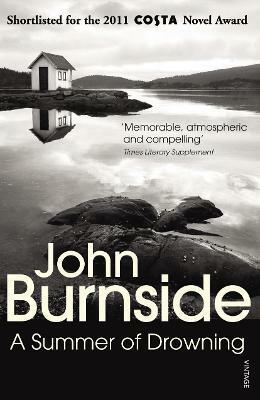 Its evasions may discomfit those who like to know exactly where they stand, but those who enjoy being teased as well as spooked should relish an eerie, ethereal novel that alludes to Lewis Carroll and uses methods of Hitchcock and David Lynch"
John Burnside is amongst the most acclaimed writers of his generation. His novels, short stories, poetry and memoirs have won numerous awards, including the Geoffrey Faber Memorial Prize, the Whitbread Poetry Award, the Encore Award and the Saltire Scottish Book of the Year. In 2011 he became only the second person to win both the Forward and T. S. Eliot Prizes for poetry for the same book, Black Cat Bone. In 2015 he was a judge for the Man Booker Prize. He is a Professor in the School of English at St Andrews University.